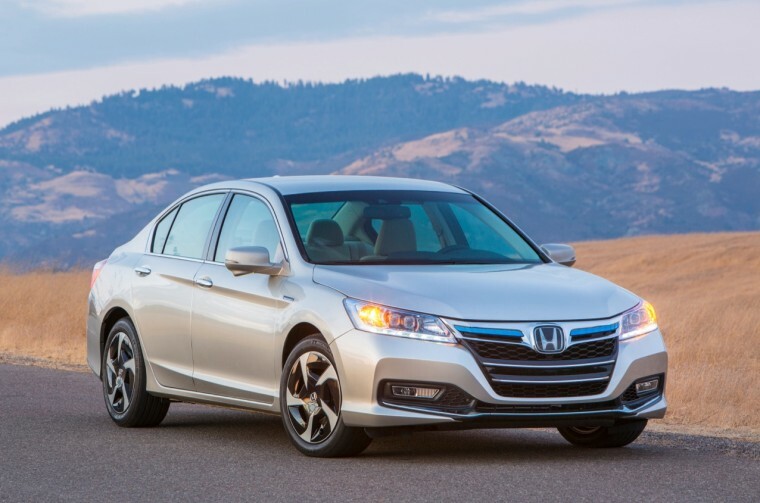 Honda is planning introduce its first plug-in hybrid-electric vehicle, the Accord PHEV.American Honda Motor Co. If the upcoming L.A. Auto Show is any indication, American motorists are in for a green holiday season. A preliminary estimate shows as many as 50 new cars, trucks and crossovers will make their debut during the annual event, the first big U.S. auto show of the 2013 model year. A sizable chunk of those new models will be battery-based, including everything from conventional hybrids to pure battery-electric vehicles. But the L.A. show also will point out how even conventional gasoline powertrain technology continues to become more and more environmentally friendly. The 2013 Ford Fusion Energi Plug-In Hybrid shown in Tuxedo Black Metallic.Ford Motor Co. Among the most significant debuts already announced for Los Angeles, Honda will introduce its first plug-in hybrid-electric vehicle, the Accord PHEV. The list of pure battery-electric vehicles, or BEVs, will include the new Fiat 500e and the Chevrolet Spark EV, General Motors first fully electrified model since it pulled the EV1 from production just before the turn of the new Millennium. During a recent two-day media background session, GM revealed some ambitious plans for its electrification program – which began with the December 2010 launch of the Chevrolet Volt plug-in and which will soon add both the Spark EV and the upcoming Cadillac ELR plug-in. In all, the maker hopes to sell 500,000 battery-based vehicles between now and 2017. “Plug-based solutions will play a significant role in our technology portfolio going forward,” said global product development chief Mary Barra. Nissan may be even more ambitious. Before the end of the decade, it intends to be selling as many as 500,000 battery-based vehicles annually, with products including the planned Infiniti LE battery-electric vehicle set to join the Nissan Leaf it launched about the same time the Chevy Volt hit showrooms. For its part, the Fusion and C-Max Energi plug-ins will be part of a wave of eight advanced battery vehicles Ford plans to launch within the next couple years, according to Ken Czubay, the maker’s vice president of U.S. Marketing, Sales and Service. The first production plug-in hybrid vehicle from Ford, the C-MAX Energi is equipped with an illuminated charge port located near the driver's door for easy plug-in access.Ford Motor Co. But not everyone is quite so upbeat. Though he will try to wear a smile during the debut of the 500e, Fiat/Chrysler CEO Sergio Marchionne has dubbed battery cars “economic lemons,” a reference to the reality that the underlying technology is so expensive manufacturers have to absorb a significant portion of the price tag in order to win over consumers. By some estimates, the current crop of BEVs and PHEVs cost at least $10,000 more to produce than they are selling for – before a buyer works in the available federal and state tax credits. No wonder the brand new Honda Fit EV and Toyota RAV4-EV models that will be displayed in L.A. will only be sold at a limited number of California dealerships for at least the next few years. Critics deride those offerings as “compliance cars,” built only to satisfy strict zero-emission vehicle, or ZEV, mandates enacted by the demanding California Air Resources Board. “No one wants to be locked out of the California market,” acknowledges John Mendel, the top American executive at Honda, one of the major makers required to meet the ZEV rules. Ironically, the L.A. Auto Show will, yet again, give skeptics the opportunity to promote alternatives to battery power. The new Dodge Dart Aero model approaches the fuel-efficiency of comparably sized hybrids, note the organizers of the annual Green Car of the Year Award which is announced during the media days at the LA show. The 2013 C-MAX Hybrid SEL shown in Sterling Gray Metallic.Ford Motor Co. The new Mazda CX-5 SkyActiv crossover will also be in contention, another model that relies on the latest breakthroughs in conventional gas power. And the Ford Fusion was named a finalist as much for its advanced, gas-powered EcoBoost engine as for its hybrid and plug-in hybrid options. Only the new Toyota Prius C and Ford C-Max models, among the five finalists, are exclusively battery-based. The Green Car of the Year Award has notably honored diesels on several occasions. And past winner Audi will bring four new diesels to the LA Auto Show this year, including high-mileage versions of its A6, A7, A8 and Q5 models. Set to start rolling out next year, they’re expected to deliver hybrid-like fuel economy “but without sacrificing performance,” proclaims Audi of America President Scott Keogh. While Californians may like to think of their state as the greenest in the country, the reality is that they still appreciate muscle. According to Mercedes-Benz, a full 25 percent of all the maker’s high-performance AMG models are sold in Southern California. Bentley, Jaguar and Porsche will also reveal new high-performance products at the LA Convention Center. But these days, one can be mean and green. Or, at least, greener. The new Porsche Carrera 4S will get a big bump in horsepower – even while delivering about 15% better fuel economy than the outgoing model. And BMW will bring to LA a version of its upcoming i8 plug-in, the first in a new line of sporty, battery-based vehicles that will also include the i3 battery-electric city car. The LA Auto Show has a tradition of focusing on green technology. But California itself has a history of setting the trends that eventually sweep across the rest of America. So what you see at the Los Angeles Convention Center later this month is likely to influence what you drive wherever you live in the years ahead.